After we ate at a dining place inside the Clarion hotel, we explored the hotel's vicinity. They have two big ponds located in front and at the back. The kids love watching the ducks and other birds swimming in the ponds. Then we checked out the playground and the kids wore out themselves playing. When we returned at the hotel, we sent our hubby to buy some water and fruits while the kids and wives had fun chitchatting, playing and chilaxxing. Those are just the beginning of our fun together with the Diaz family. 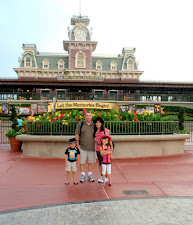 More pictures of our Disney World adventure will be posted in the coming days. Lots of red and it seems some good times! I can hardly how grown your little boy looks in this pic. Where has the time gone! You can say it again Carletta, time flies! omg, sa wakas nagka-kitakitz na kayo mga yotch. pretty so pretty, and the bonding looks so inviting. me jealous :) enjoy your time rose and dhemz. lovely kiddo pics, they are so happy. I am so looking forward to chillaxing in France - beginning of September! Bring it on! Looks wonderful. I'm all for chillaxing! Chit chatting and chillaxing....two of my favourite things! I am so thrilled to see both the Cottrill and Dias family interacting together. The photos tell them all. I love your photo with Dhemz at the bedroom. And the photos of the three kids are simply marvelous. Even the dads had their moments of bonding too. Thanks for the post. God bless you all always. Oh my, All your pics shout FUN, FUN, FUN!!! What a fun post, and all the young ones are so cute. Looks like the fun is just beginning. Have a wonderful week! Saya naman talaga ... Kaiinggit. wow sis! nag meet na kayo finally! sarap naman ng bonding. at ang mga kids, mga pretties talaga!